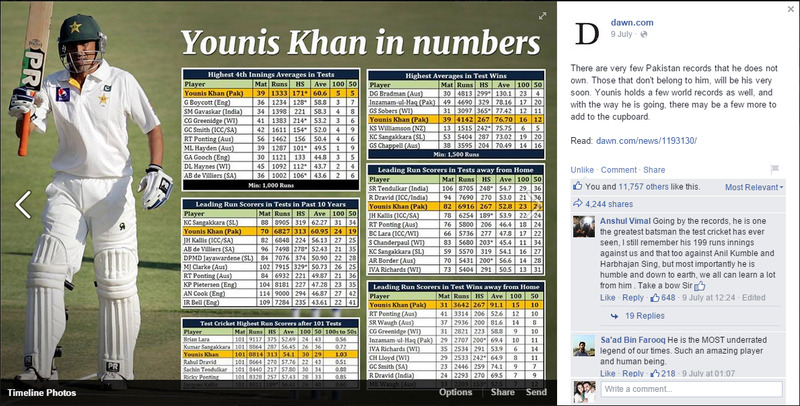 Two weeks ago, we witnessed my article on Younis Khan become one of the most read and shared post on social media. Now, over the past two days, we have received an unprecedented reaction to my article that compares the ODI era under Misbah and Azhar. The reaction, however, has been quite varied. We have been ridiculed by some who stand strongly (and blindly) by Misbah the ODI captain, while at the same time we have been appreciated by two of the most respected sports journalists of our time - Ahmer Naqvi and Emmad Hameed - who have followed up with articles of their own regarding Pakistan's recent ODI resurgence. While Ahmer has followed up with a brilliant statistical piece highlighting the differences between Misbah's and Azhar's ODI teams, Emmad fondly writes about the last time Pakistan's batting was so dominant and how this team is shaping up so well. I can't thank these two, and many others who have read, shared, and commented on the article, enough for the mentions and appreciation. Besides this appreciation, there was also some retaliation as I mentioned. Instead of replying to each one individually, which I tried to do yesterday but failed in getting the message across and in process got called all sorts of inventive names like "a well documented Afridiot", I thought it best to reiterate some points in one place. 1. 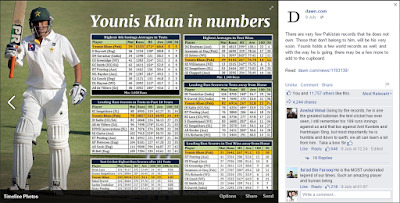 The entire article is an analysis of the performance of batsmen in ODIs. There is no mention of bowling performance. The fact the Misbah was excellent in how he used bowlers in ODIs holds no bearing on how he crippled our batting in ODIs. 2. Being a critic of Misbah does not automatically make one a Afridi fan, and vice versa. It is quite humanly possible to love both, hate both, appreciate certain qualities of both, and criticize other things about both. "Humanly" being the key word. 3. While openly blaming Misbah for destroying our ODI batting over 4 years, I have also publicly hailed his test leadership, talked of how he is the best thing to happen to Pakistan test cricket, and appreciated his utilization of bowlers in ODIs. It does not make me a Misbah hater when I say that he was the single reason for our regression in ODIs between 2011 and 2015. 4. If the same Misbah fans can praise him for taking Pakistan to number 3 in the test rankings, shouldn't they also criticize him for taking Pakistan to number 8 in the ODI rankings? Just common sense, isn't it? 5. It is interesting how so many people blame Afridi, Malik, and Hafeez for having captaincy aspirations and under performing under Misbah. Isn't it so ironic that despite that, Hafeez is Pakistan's leading run scorer under Misbah, and that besides some outstanding bowling efforts, most of Pakistan's ODI victories under Misbah were a result of outstanding performances from Hafeez and Afridi. In fact Afridi's numbers in ODI wins under Misbah's captaincy are exceptional! 6. The problem I have was never the sacking of Afridi as captain of the ODI team. The problem was appointing Misbah as ODI captain. The person he replaced and alternative options are irrelevant. Misbah was the wrong choice as ODI captain. 7. When Misbah took over the Test team in 2010, it was in turmoil. Yes, it was facing the worst scandal in its history. When Misbah took over the ODI team in 2011, they were World Cup Semi Finalists, had won their last two ODI series vs NZ (3-2) and vs WI (3-2), and lost the two ODI series prior to that vs SA (3-2) and vs Eng (3-2). The ODI team was NOT in any turmoil. 8. The argument against sample size is something that is partially accurate. I say partially because I can agree to revisit the performances of Hafeez, Malik, Haris, and Azhar after a year or two when they have faced tougher opposition in tougher conditions, and when they have played more ODIs under Azhar's captaincy. I also say partially because the sample size in no way changes the fact that in 4 years under Misbah, Pakistan scored > 280 only 5 times and chased > 250 only twice, yet Pakistan has done the same in only 4 months under Azhar Ali. In fact, last night they just completed a third successful chase above 250, making it more times than they ever managed under Misbah. Why is it so difficult to understand that in 4 years under Misbah, Pakistan also played in batting paradises, they also faced Bangladesh and Zimbabwe (in fact more times than they have done now), they played against even weaker opposition like Afghanistan, Ireland, Scotland, and yet they managed a score above 280 only 5 times. 9. For those saying that beating Sri Lanka is no big deal because they are a team in transition with the retirements of Sangakkara and Jayawardene, what about our team? Aren't we also a new team with the retirements of Misbah and Afridi, the absence of Saeed Ajmal, and the ban on Hafeez? Moreover, it is our batting that is winning the matches and the presence of Sanga and Mahela would not have had much of an impact on our batting. 10. Last night's win further strengthened my argument regarding a changing mindset within the Pakistan camp. In his post match interview, Ahmed Shehzad clearly said "we are trying to change the way we used to bat", highlighting that he and other batsmen are making a conscious effort to bat more in line with the requirements of modern day ODI cricket. Shehzad's innings was testament to that fact. I believe I have addressed all the arguments that were raised by some people. While I understand that I cannot change certain opinions, I am a firm believer of presenting arguments with evidence and there is ample evidence that suggests that under Misbah's captaincy, Pakistan witnessed its worst era of ODI cricket ever. That in no way takes away the fact that under Misbah's captaincy, Pakistan has also witnessed one of its best, if not the best, era of Test cricket ever. 1. 'Misbah crippled our batting' is the narrative you're trying desperately to build but until now, you've failed to provide any proof for it to be taken seriously. It can easily be argued that Misbah was himself crippled by his teammates' inability to provide good starts and finish well. It was often Misbah himself who had to first consolidate and then finish the innings while minimizing risk. On occasions where the situation allowed him to play with freedom, he showed he could. 2. It's possible and very much OK for someone to appreciate both Afridi and Misbah or criticize them as long as it's based on some factual evidence, not cherry picking of stats to suit a weak argument. 3. Appreciating Misbah's test captaincy or his handling of bowlers does not mean you can't have a grudge against Misbah the ODI captain/batsman. The former have to be acknowledged if one is to be taken seriously so you don't really have much of a choice there. There are far too many instances where you are quick to blame Misbah for others' lack of performance when there are far more logical reasons (players' skills, conditions, opposition's bowling, etc.) than some curse that Misbah had over the team. 4. Misbah did not take Pakistan down to no.8. Please check Pakistan's ODI ranking when Misbah took over and what it remained during his tenure. We were mostly 6, sometimes going up to 5. During the WC, we dropped down to 7 if I remember correctly but by qualifying for the QFs, we were back upto 6. That's a fair reflection of our ODI team's strength in that timeline. It's actually the 3-0 loss to Bangladesh under Azhar that got us down to no.9 for the first time ever. We are now at no.8 which is still worse than Misbah's era. Do not mislead people with incorrect facts. 5. Afridi's performance in the 35 wins you mentioned may be better than his career figures, that however does not make them great. Since we're talking about batting, he had a pretty average career overall despite occasional brilliance and his performance under Misbah is similar. Calling an average of 31.56 in wins exceptional highlights your bias. It's well known that a player's performance in wins will be better than his performance in losses. However, that's barely an acceptable average for someone batting at no. 7 mostly and charged with being the finisher and having the opportunity to stay not out as well. His average is 18.70 in 33 losses. That's pathetic for someone batting with a long tail at no.7 and can be said to have contributed a lot to the defeats we suffered and it's the defeats that Misbah gets flak for, not the wins. With Hafeez, his role in batting was either as an opener or as no.3. As no.3, he was exceptional averaging 50.04 in 29 innings but he was poor as opener averaging 30.86 and 31.22 in a total of 37 and 9 innings at no.1 and no.2 respectively. These averages are also inflated by 2 not out centuries against Zim at no.1 and no.3. 6. You keep insisting Misbah was the wrong choice as ODI captain and that it has nothing to do with the available options or the guy preceding him. That argument nullifies itself. If you appoint someone, you do so on the basis of available options. If he then does better than the one preceding him, how can you say he was a wrong choice? 7. Misbah won ODI series in Ind, SA, Windies, Zim, Ban and the Asia Cup 2012. How does Afridi compare? Afridi's Pakistan made it to a WC SF in 2011 where all three sub-continent sides were fancied anyway. Misbah's Pakistan made it to a QF Down Under and lost to the best side. How can you call the first an achievement and discount the second? Pak beat only NZ and Windies in bilaterals, two weak teams in Afridi's era. They have no other significant ODI series wins under him. I fail to see any justification for calling Misbah's appointment a huge blunder especially when he came after Afridi who had a very modest record as captain himself. 8. Good that you (partially) accept the sample size argument. You don't really have a choice with just 10 matches played under Azhar, that too against weak or mediocre opposition. You keep bringing up 250 chases, yet fail to note that under Misbah, we had to chase 250 on relatively few occasions, such were the conditions the matches were played in. The fact that the bowlers were rarely conceding this many runs combined with the fact that the conditions were generally not conducive to big totals makes this comparison with Azhar's side irrelevant. The bowlers are now conceding 250 regularly. Yet, our win ratio is 5/10 matches. Just goes to show the difference in conditions. Same is the case with scoring 280+ batting first. It simply didn't happen in Misbah's era very often because we rarely got such conditions and such poor bowling attacks to play against, nor did other teams get that many against us very often. It's a wrong assertion that Pakistan played a lot of matches on batting paradises under Misbah against weak opposition. They played ZERO matches in Pakistan. Under Azhar, they've played 3 in Lahore, all against Zim where they've racked up 280+ totals. Misbah's team only faced Zim in Zim where the totals are always lower regardless of who is touring. Batting conditions and outfields are different. Of the 6 matches played in Zim against Zim under Misbah, we won 5 and lost 1. In 5 matches, we batted first scoring an average of 264 per innings, a high score of 299 and a low score of 244. This shows our batting did very well in the conditions, scoring above 280+ once as well. The one match we chased, the target was 226 which was chased down in 42.1 overs. Again, you can't chase 250 when the target is 226. Of the 6 matches played in Ban against Ban, we won all 6; batting first in 4 of them and chasing twice. The average score batting first was 234.25 with a high score of 262 (twice) and a low score of 177. Obviously, the average was brought down by one low scoring match in difficult conditions at Chittagong which we still won easily by 58 runs. Of the two matches we chased in, the target was 92 in one and 327 in the other. So there you go, only one big chase well over 250 in Ban and we did it successfully under Misbah. Under Azhar, we scored exactly 250 twice (once while chasing 300+ and once while batting first) and 239 in the other match batting first. We lost all three. Despite reaching 250 twice, losing badly indicates the conditions were easy for batting unlike the matches played under Misbah which were all won, even with a score of 177. The average score under Azhar batting first in Ban is 244.5 which is barely a 10 run improvement despite much easier batting conditions. Hence, we lost both times. Reaching 250 while chasing 300+ is also nothing to brag about. You talk about Pakistan facing Ireland, Scotland and Afghanistan under Misbah and suggest that we should have racked up big scores there. However, you fail to realise that these matches were NOT played on batting paradises where 280 is a given batting first or 250 is routinely chased. We played Scotland in Scotland, Ireland in Ireland (both places with Eng like conditions where the ball moves around) and Afghanistan in UAE and Ban where batting averages are lower than in Pakistan or SL due to slower pitches. We played 4 matches against Ire in Ire, winning 3 and tying one. The only match we batted first in, we scored 266 in a 47 over game which was tied. This is equivalent to 283 in 50 overs. The other 3 matches we chased in were all won and the target in each case was <250 (95, 239, 230). Again, not the batting's fault that they didn't get 250+ targets to satisfy your criteria. In the recent WC match against Ire, again the target was 238 which was achieved easily. We played just one match against Sco in Sco batting first scoring 231 and winning by 95 runs. Not an easy batting pitch again unlike what Azhar's team has been playing on mostly. Against Afg, we played just 2 matches winning both. Chased 196 in the first one easily at UAE and defended 248 at Fatullah (Ban) in the other one just as easily. Again, lower scoring matches because of different conditions. Coming to the current series against SL under Azhar, it really cannot be compared to matches played against SL in SL under Misbah. You are forgetting that besides missing their two best batsmen, they've also been missing their best bowlers. Herath is rested from ODIs and Malinga is basically MIA because he's not the same bowler he used to be. Kulasekara is no longer in favour while he used to torment us with movement earlier. Matthews has been their most reliable bowler this series and the biggest difference is they have no one to choke the runs the way they used to in the middle overs. The spinners are barely international level and inexperienced, the support bowlers like Perera and Lakmal haven't performed in ages. Granted, Pakistan are also missing Misbah and Ajmal but then they have Yasir and Azhar in the lineup. Also, missing Afridi in SL is a good thing as far as batting is concerned. When's the last time he made a significant contribution in SL against SL as a batsman? Rizwan and co are more reliable despite being new. Hafeez was banned only in the 3rd and 4th match, he bowled in the first two. Though again we're talking about batting so that's not relevant. You're right that Sanga and Mahela wouldn't have had much of a direct impact on our batting but SL's poorest bowling attack in ages does have an impact on our batting. They've been crying for Matthews to play more than 2 specialist bowlers in commentary too. In short, SL's bowling at the moment is worse than Ban who have better pacers and spinners. Btw, under Misbah, we successfully chased 275 in a 45 over game last year in SL. Back when they actually had a good attack for home conditions and 275 was not considered chaseable there in 50 overs, let alone 45. Granted, we also lost in a chase of 311 but that's expected. 300 has never been chased in SL. There's a very clear trend under Azhar. The bowlers are routinely conceding more runs than they did under Misbah, making 250 chases a more common occurrence. You do something often enough and you get better at it. The opposition's bowling strength has also been largely poor resulting in more successful chases. The conditions are also more favorable for batting given a 280+ score has been chased against us successfully too in this series. I can only shake my head at the fact that you quoted Shahzad's comment, "we are trying to change the way we used to bat", as evidence that somehow Misbah had ingrained a defensive approach and mindset in the team earlier. He has a lot of quotes from Misbah's era saying he wants to play positive cricket, his natural game and so forth. If he's understood that being kicked out of the team must have had something to do with his batting, then I congratulate him for realising the obvious. Shahzad has always been known as someone who looks pretty at the crease, hits some boundaries and then gets bogged down when he can't rotate strike. He gets stuck at one end because he keeps hitting the ball hard and straight to fielders instead of playing with soft hands, especially against spin. That's not mindset, it's a technical issue. If he says he's changed the way he used to bat, we are yet to see it. He's just been fed with some poor bowling and received more boundary balls than usual. He also has a reliable partner at the other end unlike when he played under Misbah. Without the loss of early wickets and the pressure of having to do the bulk of the scoring, he may not get as frustrated as he used to and hence might produce better results. But his change of mindset so far is invisible. He was close to getting out the other day when Malinga bowled a couple of tight overs with him in the 40s. It was luck that he had a catch dropped at slip and he proceeded to score 95. He's scored hundreds at nearly run a ball under Misbah as well, notably in SA to win the series in 2013. There has been no magical change in his batting just because he says something cliched the night he scores a lucky 95 against a poor bowling attack. He was scoring runs freely in the WC too, against teams like UAE and Ireland. Misbah's hoodoo seems to affect him only occasionally, mostly against better teams with better bowlers and under more difficult batting conditions. Carnivore, stop writing lengthy nonsensical essays. The fact of the matter is that our ODI ranking DID drop under Misbah. Going from 6 to 8 is a drop. Where did you learn to count? And going from 6 to 8 is way worse and way harder than, say, going from 2 to 4. The fact that we went to 9 shortly after Misbah left reflects badly on MISBAH, not on the new inexperienced captain who hasn't been responsible for grooming the team for the last four years. Misbah is the one who was responsible for grooming players, aggressive batsmen, a good young captain while he had the team for four years. And he failed to do so. Which is why we are still struggling under the new captain. The stats speak for themselves. No room to argue here. Misbah, a great Test captain and the worse ODI captain Pakistan has ever had.